The MDX got a significant design update in 2017 with a new front clip and optional hybrid powertrain. So, the 2019 upgrades are mainly confined to the interior. The new MDX went on sale in Canada on Monday with a starting price of $56,562.50, including delivery. That’s just $300 more than the 2018 model, which is still available. 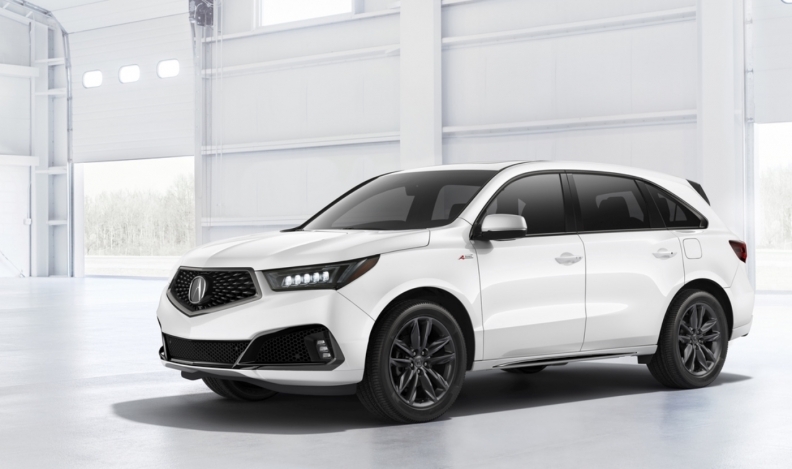 The new MDX A-Spec starts at $62,662,50, with standard all-wheel drive. The MDX got a significant design update in 2017 with a new front clip and optional hybrid powertrain. So, the 2019 upgrades are mainly confined to the interior. The changes are fairly minor -- new interior trim wood, standard four-way power lumbar adjustments for the front seats and five new exterior colours. An active damper system is now offered as an option across the line. But the biggest news is the rollout of a new A-Spec trim. A-Spec is an appearance package that offers a sportier exterior look, with trim-specific 20-inch wheels and low-profile tires, a unique front fascia, dark trim and larger exhaust finishers. A-Spec is the only way to get the new Apex Blue Pearl exterior paint, as well. With the A-Spec trim, the interior offers red or black leather-trimmed Alcantara faux-suede sport seats, special A-Spec gauges and a sport steering wheel with paddle shifters. The MDX is still offered with either front-wheel drive or SH-AWD — Super Handling All-Wheel Drive — which can send up to 70 per cent of torque rearward. The sole engine option, a 3.5-litre naturally aspirated V-6 producing 290 hp and 267 pound-feet of torque, is unchanged. The A-Spec trim uses 12.2 litres of fuel per 100 kilometres in the city, 9.5 on the highway and 11 combined. All other trims — the base, Technology, Elite and 6P Elite — use 12.2, 9.0, 10.8, respectively. MDX sales are down 0.4 per cent to 3,157 units through the first seven months of 2018 when compared with last year. Sales in 2017 were up 7.6 per cent to 5,838 when compared with 2016. Only the RDX outsold the MDX last year for the luxury line.